Tail posture predicts tail biting outbreaks at pen level in weaner pigs. By Helle Pelant Lahrmann, Christian Fink Hansen, Rick D’Eath, Marie Erika Busch, Björn Forkman, 2018. Applied Animal Behaviour Science 200: 29-35. • Changes in tail posture can predict a tail biting outbreak at pen level. • Percentage of hanging tails in pens close to an outbreak was almost doubled. • A correlation between number of tail damages and lowered tails were identified. • No changes in activity was identified prior to a tail biting outbreak. Detecting a tail biting outbreak early is essential to reduce the risk of pigs getting severe tail damage. A few previous studies suggest that tail posture and behavioural differences can predict an upcoming outbreak. The aim of the present study was therefore to investigate if differences in tail posture and behaviour could be detected at pen level between upcoming tail biting pens (T-pens) and control pens (C-pens). The study included 2301 undocked weaner pigs in 74 pens (mean 31.1 pigs/pen; SD 1.5). Tails were scored three times weekly (wound freshness, wound severity and tail length) between 07:00 h–14:00 h from weaning until a tail biting outbreak. An outbreak (day 0) occurred when at least four pigs had a tail damage, regardless of wound freshness. On average 7.6 (SD 4.3) pigs had a damaged tail (scratches + wound) in T-pens on day 0. Tail posture and behaviour (activity, eating, explorative, pen mate and tail directed behaviour) were recorded in T-pens and in matched C-pens using scan sampling every half hour between 0800–1100 h 1700–2000 h on day -3, -2 and -1 prior to the tail biting outbreak in T-pens. Further, to investigate if changes in tail posture could be a measure for use under commercial conditions, tail posture was recorded by direct observation from outside the pen. The live observations were carried out just before tail scoring on each observation day until the outbreak. The video results showed more hanging/tucked tails in T-pens than in C-pens on each recording day (P < 0.001). In T-pens more tails were hanging on day -1 (33.2%) than on day -2 (24.8%) and day -3 (23.1%). Further, the number of tail damaged pigs on day 0 was correlated with tail posture on day -1, with more tails hanging in pens with 6–8 and >8 tail damaged pigs than in pens with 4–5 tail damaged pigs (P < 0.001). Live observations of tail posture in T-pens also showed a higher prevalence of hanging tails on day 0 (30.0%; P < 0.05) than on day -3/-2 (17.2%), -5/-4 (15.4%) and -7/-6 (13.0%). No differences in any of the recorded behaviours were observed between T-pens and C-pens. In conclusion, lowered tails seem to be a promising and practical measure to detect damaging tail biting behaviour on pen level even when using live observations. However, there were no changes in activity, eating, exploration or tail-directed behaviours prior to a tail biting outbreak. Automatic early warning of tail biting in pigs: 3D cameras can detect lowered tail posture before an outbreak. By Richard B. D’Eath, Mhairi Jack, Agnieszka Futro, Darren Talbot, Qiming Zhu, David Barclay, Emma M. Baxter. 2018. PlosOne. Tail biting is a major welfare and economic problem for indoor pig producers worldwide. Low tail posture is an early warning sign which could reduce tail biting unpredictability. Taking a precision livestock farming approach, we used Time-of-flight 3D cameras, processing data with machine vision algorithms, to automate the measurement of pig tail posture. Validation of the 3D algorithm found an accuracy of 73.9% at detecting low vs. not low tails (Sensitivity 88.4%, Specificity 66.8%). Twenty-three groups of 29 pigs per group were reared with intact (not docked) tails under typical commercial conditions over 8 batches. 15 groups had tail biting outbreaks, following which enrichment was added to pens and biters and/or victims were removed and treated. 3D data from outbreak groups showed the proportion of low tail detections increased pre-outbreak and declined post-outbreak. Pre-outbreak, the increase in low tails occurred at an increasing rate over time, and the proportion of low tails was higher one week pre-outbreak (-1) than 2 weeks pre-outbreak (-2). Within each batch, an outbreak and a non-outbreak control group were identified. Outbreak groups had more 3D low tail detections in weeks -1, +1 and +2 than their matched controls. Comparing 3D tail posture and tail injury scoring data, a greater proportion of low tails was associated with more injured pigs. Low tails might indicate more than just tail biting as tail posture varied between groups and over time and the proportion of low tails increased when pigs were moved to a new pen. Our findings demonstrate the potential for a 3D machine vision system to automate tail posture detection and provide early warning of tail biting on farm. Early indicators of tail biting outbreaks in pigs. By Maya Wedin, Emma M. Baxter, Mhairi Jack, Agnieszka Futro, Richard B. D’Eath. Day and time of day had little or no effect on these findings. Tail biting outbreaks in pig farming cause suffering through pain and stress, and producers lose revenue due to carcass condemnation. Reliable behavioural indications of when an outbreak is imminent would provide farmers with tools for mitigating the outbreak in advance. This study investigated changes in body and tail posture in the 7 days pre-outbreak. Pigs in 15 groups with a mean (±s.d.) group size of 27.5 (±2.6; 427 in total) were raised from birth under intensive commercial conditions and with tails intact. Twice daily inspections were made, and a tail biting outbreak was identified (and treated) if 3 or more pigs had fresh tail injuries, or any pig was seen with a freshly bleeding tail or vigorously biting a tail. Video footage was recorded continuously to allow pre-outbreak behaviour recording of body posture (lying laterally, lying ventrally, sitting, standing) and tail posture (curled or uncurled (high, low, tucked)). 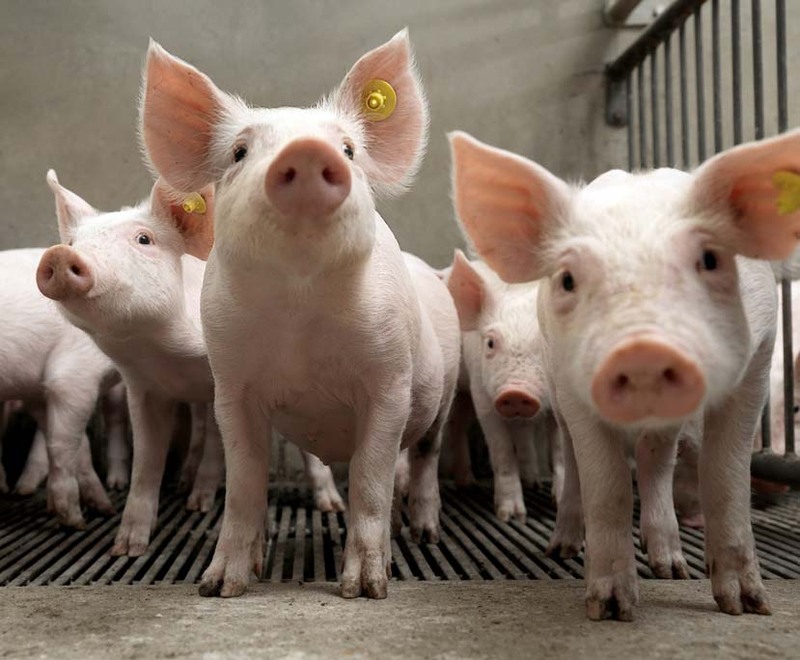 Pigs were not individually marked, thus observations were made at pen level by group scan sampling 12 times per day on day -1, -3, -5 and -7 pre-outbreak. Each outbreak group was paired with a non-outbreak group of the same age and kept at the facility at the same time which served as a control. A total of 12 pairs were used. Outbreak pigs had fewer curled tails (P = 0.013) and more uncurled (P = 0.008) and tucked tails (P < 0.001) than control pigs overall, but particularly on day -1. Outbreak groups had more tucked tails compared to control on day -7 (P = 0.001). Tail posture did not vary over days, or with time of day. Body posture was not different between outbreak and control groups, and although it was affected by time of day, there was no interaction between outbreak vs. control condition and day, or time of day. Synchrony of behaviour between pigs (more pigs in the pen showing the same body posture) was not reduced in outbreak groups. In conclusion, this study supports other recent findings showing that an increase in tucked tails, and reduced curled tails is an advance indicator of a tail biting outbreak giving at least 7 days warning, and it does not matter what time of day tails are observed. Pig farmers could take note of tail posture changes to identify high risk pens. Considerable variability between pens, and in the timing and magnitude of change means that technology to automate tail posture detection will be of benefit. I will defend my PhD on Monday, April 9 at 13.00 (UTC +2, due to summertime CEST). The title is “Two strategies to prevent tail damage in finishers: removal of risk factors and early detection”. The defence will be in English. It will begin with a 45 min lecture, a short break and then continue with questions from the opponents until latest 16.00. The opponents are Emerita Professor Sandra Edwards and Dr. Rick D’Eath. Also, if you know of anyone that could be interested, please just forward this email. Everyone is welcome! Looking forward to seeing all of you in the future! Did European pig-welfare legislation reduce pig welfare? Perhaps not, but experts confirm that common indestructible materials are not proper enrichment for pigs at all, except perhaps for an enhanced novel branched-chains design. Optical flow to monitor tail biting outbreaks in pigs. What can carcass-based assessments tell us about the lifetime welfare status of pigs?